After three years of (studio) silence one-man death metal band Bloodsoaked will make it's return on September 2nd. For fans of Death, Morbid Angel, Obituary, Decide and Cannibal Corpse that should be an important date as this Raleigh, North Carolina project has recorded an album that covers all the bases. New studio material? Yep. That would be "Devouring" , "Abomination" and the title cut. Live material? But of course! How about a few cover tracks to sweeten the deal? Well now, that is where this one really gets interesting! OK, make that awesome! You see Bloodsoaked, a "band" that was formed in 2006 and has three additional full-length releases to it's name, throws in not one, but TWO gems from the hard rock scene of yesterday! Getting the royal (brutal death metal) treatment are Cinderella's "Shake Me" and (a personal favorite of mine) Ratt's "You're In Love"! And for that sole reason I ENTHUSIASTICALLY recommend this upcoming release from Bloodsoaked! That's not to say that the original music that comes from Bloodsoaked is anything but enjoyable. 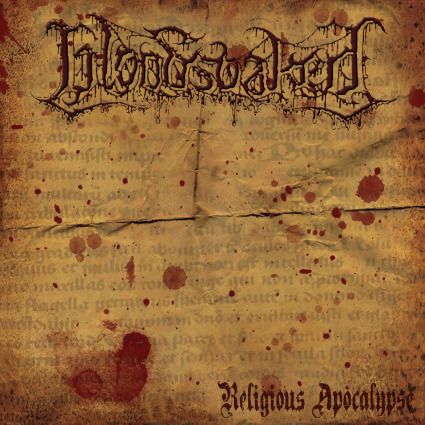 The Brainchild of Peter Hasselbrack* (ex-Archaic Winter, ex-Deslok), Bloodsoaked does brutal death metal just about as well as anyone else. Scratch that. Bloodsoaked does a solid to the death metal scene and then some! As a vocalist/multi-instrumentalist Peter Hasselbrack is in fine form here as he is equally skilled in both areas. The original material offered here falls right in line with the above mentioned acts as Peter does a smash-up job at balancing technical death metal with the more extreme side of the genre. Ending with live versions of "Suicide" , "No God" , "Infestation" and "Grinding Your Guts" (all of which prove this band's ability to pull off it's sound in a live setting!) the new album "Religious Apocalypse" was a pleasant surprise and one that should appease both old fans and new! *On a side note Peter looks a lot like "The Russian Nightmare" Nikita Koloff!